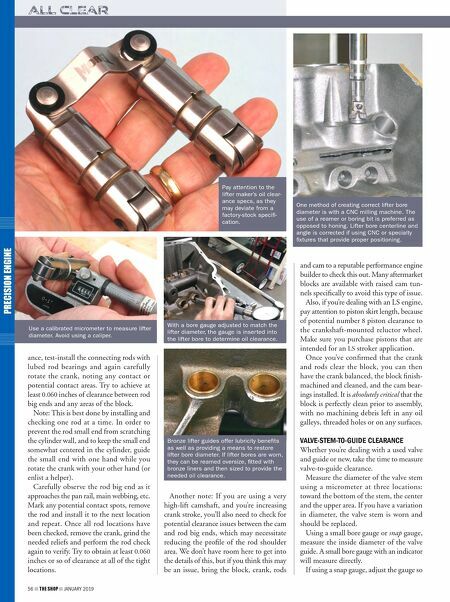 JANUARY 2019 THE SHOP 57 PRECISION ENGINE that it lightly drags as you move it through the guide. With the ball end of the snap gauge adjusted, measure the gauge with a micrometer and note the difference. If the guide shows uneven diameters or is exces- sively worn, the guides must be replaced. The small number will be the valve stem and the larger number will be the guide. Generally speaking, valve-to-guide clearance should be 0.001-0.003 inches at intake locations and 0.002-0.004 inches for exhaust. These are generalizations. If the guides are bronze, oil clearance might be 0.0008-0.0012 inches intake and 0.0012- 0.0015 inches exhaust. If the guides are cast iron, clearance will be a bit greater, at perhaps 0.0012-0.0015 inches intake and 0.0017-0.002 inches exhaust. Always check the recommended specs for a given application. Valves should also be checked for concen- tricity, which refers to how well the valve is centered to the seat. A radial concentricity gauge is inserted into the guide and rotated, noting any changes in the dial indicator. If any out-of-round is found, the guides and seats should be reconditioned. FITTING THE PISTON RINGS Piston ring end gap is critical to control compression and combustion, and to pre- vent crankcase pressure blow-by. Listed here are typical minimum end gaps for various applications. However, always follow end gaps recommended by the specific piston maker. Application Top ring Second ring Oil rails High-perf. street/strip Bore x 0.0045 Bore x 0.0050 0.015 Street turbo/nitrous Bore x 0.0050 Bore x 0.0055 0.015 Circle track/drag Bore x 0.0055 Bore x 0.0057 0.015 Blown race only Bore x 0.0060 Bore x 0.0063 0.015 The use of longer stroke crankshafts commonly requires clearancing for counterweights and/ or rod big ends. During test-fitting, slowly rotate the crank to determine interference areas and mark them accordingly. 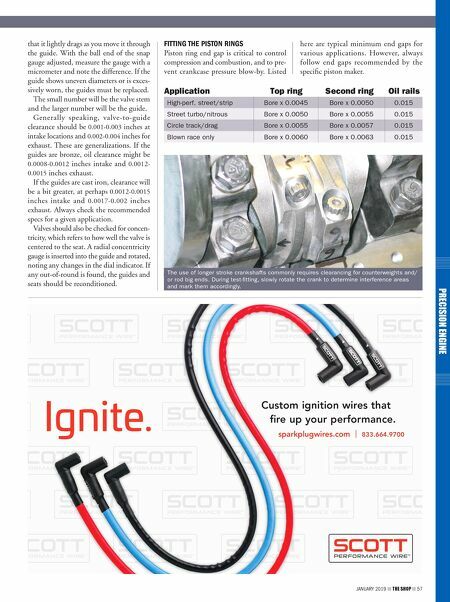 Custom ignition wires that fire up your performance. sparkplugwires.com | 833.664.9700 Ignite.